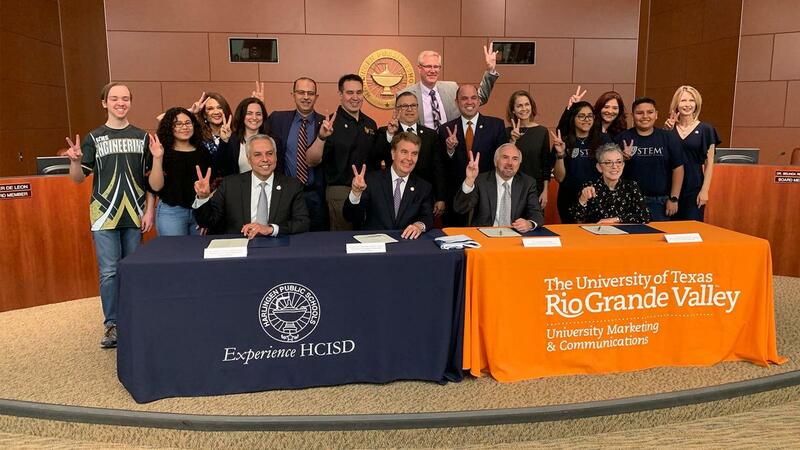 With a focus on expanding partnerships and educational opportunities for students, City of Harlingen, University of Texas Rio Grande Valley, and Harlingen CISD have collaborated on an exciting venture, spanning thousands of square feet. The three collaborating partners announced, on Thursday, Feb. 28, the opening of a new UTRGV/ECHS campus in Harlingen. With an expected completion date of February 2021, this campus will be the new housing site for hundreds of Early College High School students. This marks Phase 1 for UTRGV’s baccalaureate programming presence in Harlingen. ECHS provides students an authentic college learning experience. Under the guidance of UTRGV professors, ECHS students earn up to 60 hours of college credit by the time they graduate high school. Through a partnership with an accredited university, ECHS students graduate high school with their academic core or are on a fast track towards careers in engineering, computer science, and education. By selecting collegiate pathways they are passionate about, students save time and money while developing successful study habits. UTRGV is working with the City of Harlingen to secure the building site of the campus, featuring classroom space and teaching labs.